Cons: Ash gets stuck around the mouthpiece and can be inhaled, nastiest feeling ever. 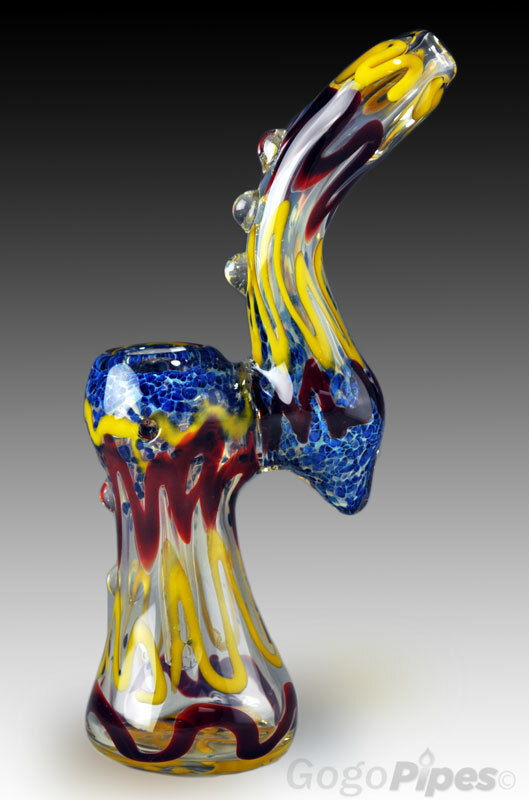 Pros: It is a very nice bubbler. It is a perfect size, and comes with a really big bowl ( but the bowl is a problem). It functions very well and I am overall very pleased, good filtration, and smooth pulls. Cons: It is not blue, I got a green one, which isn't a big deal. My biggest gripe is that it is pretty thin glass, which usually isnt a problem being as I am careful, but after only ONE use, the bowl had a crack right through the side, which is disappointing, very disappointing. Pros: If you are thinking about buying a bubbler from this website, do it. i was hesitant at first because ive never used this site and was worried about the glass quality and such. but it came in about 6 days(parcel post) quick and undamaged for 10 bucks. i was looking for something TECHNOLOGICAL that was a bubbler and i found this. looks just like the picture. Buy it. Cons: great design but the comfortable mouthpiece is hard to clean. Comments: got it here for about 50 bucks, glass on glass diffused bubbler...can't beat it.